The manufacturing of first ever denim pants in the 19th century had revolutionized the fashion industry like never before. Denim continues to be the hype till date and has gone through enormous changes to look like their current popularized forms. We have seen the denim being worn as pants varying in style. We’ve seen an era of mom jeans, bell bottoms, high waists and skinny jeans. We’ve also seen denim being worn as ensembles and as jackets, skirts, boy shorts, dungarees, dresses and what not. Denim managed to gain momentum in the masses and become a part of every household and continues to be the one stop shop for fashion enthusiasts.. However, in the modern day, where denim is not a rare sight, it becomes very hard to devise a unique groundbreaking look with them. And Ruben Galarreta’s denim designs categorized in our Triana collection are here to do just that! Our denim illusion clothes with lavish metal studs and chic print that effectively grabs attention will win you plenty of envious stares. The catch is, these designs are made of poly jersey fabric! The raw material hikes the comfort quotient multifold. Another noteworthy feature of the denim illusion legging and joggers assemblage is that they are not actually torn, they are imprinted skillfully, making it laborious for an observer to differentiate. 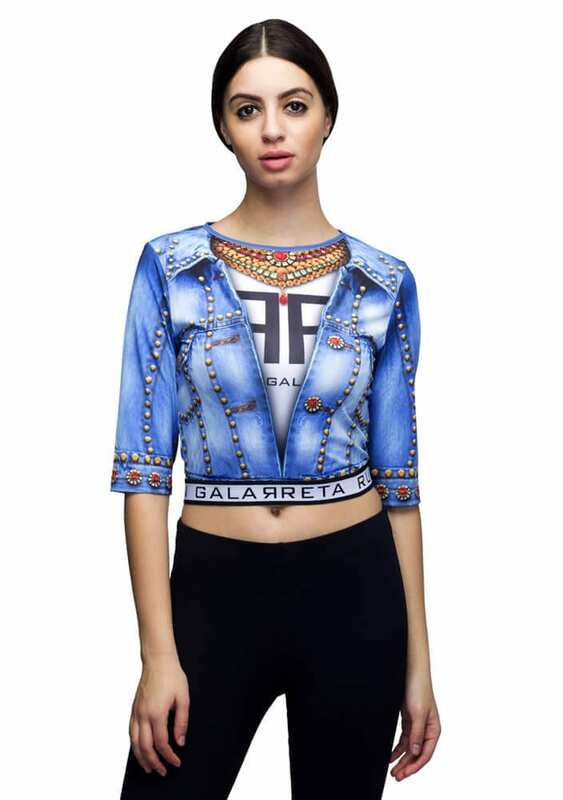 The Denim Illusion top comprises of printed satin-chiffon fabric. A must have for every casual wear lover, this is that kind of a legging which gives you the looks and style of denim and the absolute comfort of a legging. The Denim Illusion crop top comprises of printed lycra fabric. 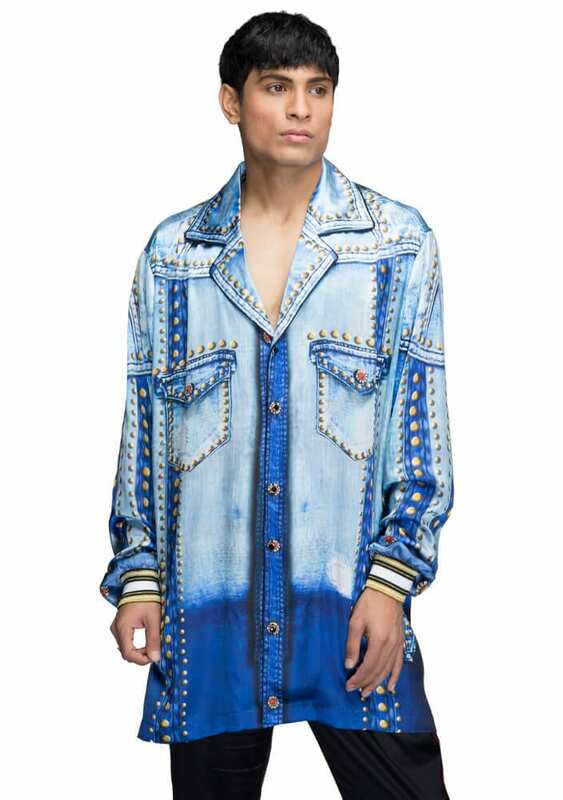 The fabric seems like denim but it is only due to the visual effects added to the fabric. The designer has intuitively constructed a product line that satisfies key desires of a buyer. Every design is outstanding in its own way. The denim illusion mini skirt and crop top give you an inevitable sultry look, you will be showered by captivated looks. The denim illusion top and joggers are unquestionably the coolest thing in the market. 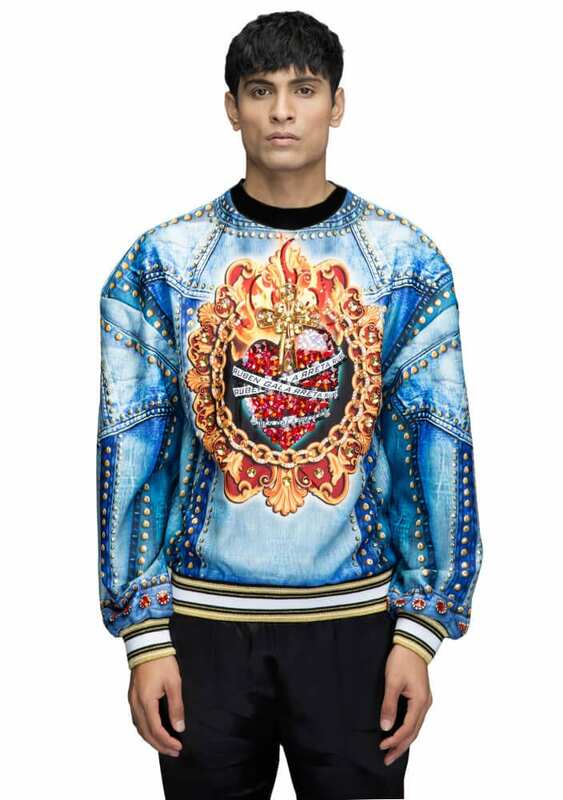 And as if this wasn’t enough, Galarreta also has a denim illusion sweatshirt! Their trendy aura is tempting and compels you do indulge a little. 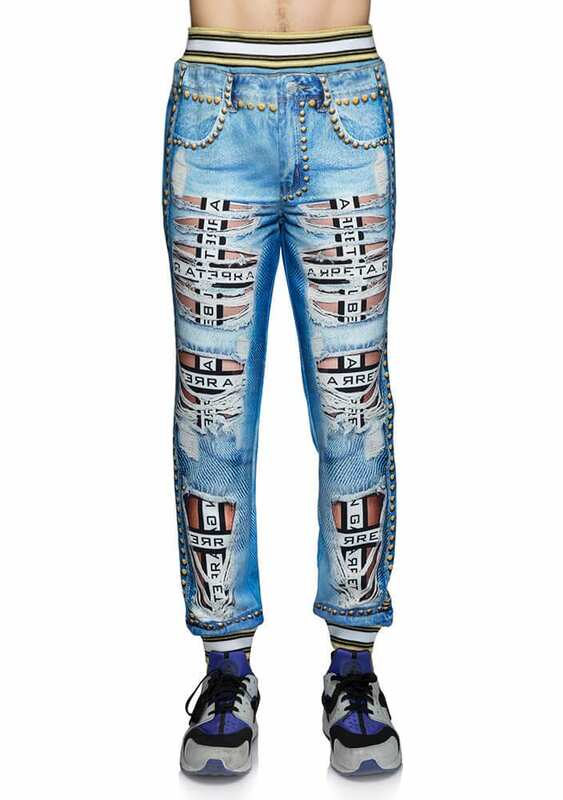 Another key attribute of the denim illusion line, is the gender neutrality. They are designed to establish themselves in men and women’s apparel alike. Our designs have been sported by both genders and looked equally stunning. Denim is versatile and makes experimenting very easy. They can be paired with quirky accessories to make them look extraordinary. But Galarreta’s designs save you the effort. Simply pairing denim illusion top and sweatshirt with denim illusion joggers, or regular jeans, complemented by black boots or vans will give you a ravishing monochrome look!